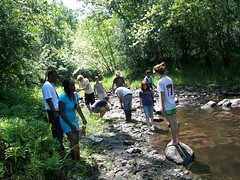 Earlier this week, a group of students who are working at the Science Museum of Minnesota came out to the St. Croix Watershed Research Station, on a field trip. Soon we were all out in Spring Creek, collecting specimens! It was a terrific afternoon!